Project Analyzer 8.1 is basic, vb, vb dotnet software developed by Aivosto Oy. 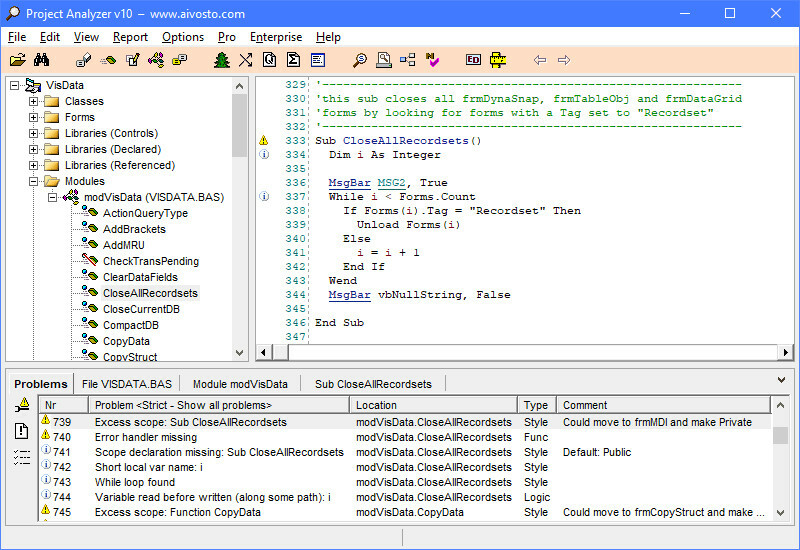 Project Analyzer is a Visual Basic source code analyzer, optimizer and documenter. Detect dead code and remove it. Surf your code as hypertext, call trees and diagrams. Document your work with a large selection of reports. 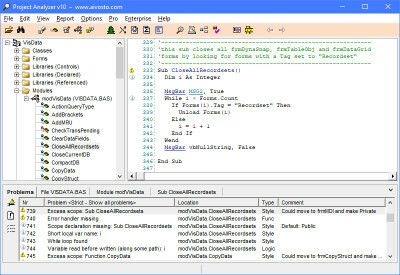 Project Analyzer does an automatic code review to enforce configurable programming standards. It detects problems such as dead code and possible memory leaks. Supports VB 3-6, VB.NET and Office VBA. This development software is shareware, which means you can download and use Project Analyzer 8.1 for free during the trial period (usually for 30 days). At the expiration of the period you will have to buy the basic, vb, vb dotnet product for $299.00. Project Analyzer 8.1 is available at regnow and Aivosto Oy website. Project Analyzer 8.1 supports English interface languages and works with Windows 98/XP/Vista. Latest Project Analyzer 8.1 does not contain any spyware and/or advertise modules, allowing installing it with no worries concerning valuable information loss. We has completely tested basic, vb, vb dotnet software Project Analyzer 8.1 many times, written and published the interesting article and uploaded installation file (7174K) to our fast server. Downloading Project Analyzer 8.1 will take minute if you use fast ADSL connection.